Happy New Year all you fabulous Paper Peeps!!!!! What a special honor it is for me to get to be the first person of the year to share a project here at Really Reasonable Ribbon . Woot woot! I'm a lucky lucky girl! Andddd being the first of the month... 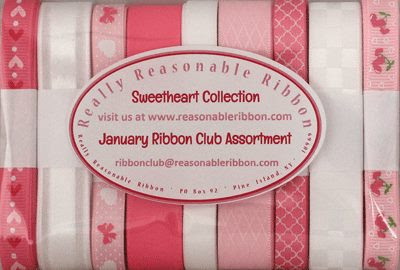 I created a project using the January Ribbon Club Assortment Sweetheart Collection which is totally pinkalicious!!!! I had so much fun with this lovely selection I just about made tooooo many bows. Almost..but not quite. There's just enough for tags that fill the Love Notes pocket. The patterned papers here are Graphic 45's Mon Amour..and of course I am in love with those teeny tiny rosebuds!!!!! I added the sentiment inside a small painted resin frame and added every pink flower I could to embellish the front. Rosebuds, Wild Roses, Sweetheart Blossoms, Coral Baker's Twine, and White Lace pair perfectly with the Ribbon Club Assortment.